An elementary school librarian's blog about books and library happenings. Summary: Heart of War is a collection of eight stories that follows the Donovan family, a family that has served in the military from WWII to Afghanistan. Each story follows one member of the Donovan family through their experiences in a particular conflict. The reader gets an up close and personal account of what war is really like. This book was recommended to me by one of my 5th grade students. In fact she liked it so much she loaned me her copy. It’s not unusual for students to mention titles of books that they like – that they think I should add to our collection. However, I believe this is the first time a student has enjoyed a book so much that she loaned me her copy. So, I took my massive TBR pile and shoved it aside and concentrated on reading this book over the weekend. I’m glad I did. The is an engaging read geared toward younger readers, but is also one that would interest older readers as well. While it does not gloss over the realities of war, it is not a graphic retelling making it a potentially good read for more sensitive readers. I have several fourth and fifth grade male students who are always looking for war/military stories. 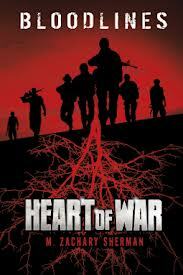 I would definitely recommend Heart of War to them. I wish could find it in hard cover so I could add it to our library collection. A paper back copy would never stand up to the amount of check outs I’m sure this book would generate. I am returning this year as the librarian for Academy Endeavour Elementary. I am a complete and total bookworm. I love talking books with students and parents. If you ask me what my favorite book is I will tell you that it changes every day. I hope you will stop by this blog often and discuss books with me. Or drop into the library and see what our wonderful students are learning. Mrs. Archer reading one of her favorite books. Ramona, named after one of Mrs. Archer's all time favorite book characters. ©2011 Mrs. Archer's Book Notes uses the "Notepad Chaos v2" theme.